This is Year A of the Church’s Liturgical Calendar, which follows the gospel of St Matthew on Sundays during Ordinary Time. In her series of articles for WelCom, Dr Elizabeth Julian rsm addresses some basic questions about Matthew’s gospel to show how it is relevant to our lives today. So what are we supposed to make of it? Breathe a sigh of relief when we’ve got to the end? Hope we never have to read it aloud? Or just put it in the ‘too hard basket’? The story of Jesus begins with the story of the Hebrew patriarchs, the kings of Judah and other virtually unknown Israelites. Biblical scholar Raymond Brown says the genealogy contains the essential theology of the entire Bible: God is a God of unpredictable graciousness; we all matter; God’s grace is endless; and this grace can work even with people like us, a motley bunch just like Matthew’s three groups, the patriarchs, the kings and the unknowns. The first section about the patriarchs tells us that Jesus’ whakapapa contains just as many sinners as saints. We may wonder why some well-known characters are absent. For example, Abraham had two sons Ishmael and Isaac. Where is Ishmael the older one? And what about Esau? Isaac had two sons. Again, the younger son is there, Jacob the trickster and liar, but not Esau. Brown points out that Matthew’s selection reflects an Old Testament insight: God does not choose the best. God’s ways aren’t our ways. Our salvation is pure gift – we don’t and can’t earn it. God is a God of unpredictable graciousness and generosity. This theology of salvation by grace evident in Matthew’s selection of particular patriarchs, is the beginning of the story of Jesus Christ. It is Jesus who will preach salvation to tax collectors and sinners and eventually die for us ‘while we were still sinners’ (Rom 5:8). The next section deals with some of the kings of Judah. According to the Book of Kings, of the 14 kings from David to the deportation to Babylon, only two, Hezekiah and Josiah, were truly faithful to God’s law. The behaviour of most of the others fell well short of the mark. The land was lost, the Temple destroyed and the Israelites exiled. The kings were basically a mixture of idolaters, adulterers and murderers. David himself was both saint and sinner. 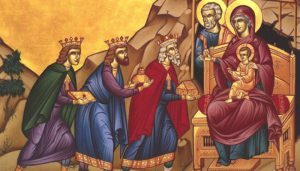 So, Jesus’ whakapapa includes the story of the Davidic monarchy with its divine origins as well as its sinful, corrupt, and quite frankly, woefully uninspiring elements. Then there are the unknowns – the obscure people who never did anything significant. But while the powerful people, that is, the kings, brought everything to rock bottom, culminating in the deportation to Babylon, it was the relatively insignificant people – the Zadoks and the Achims, who like us and like the patriarchs and kings, were probably a motley bunch of saints and sinners – who were the vehicles of restoration. Again, God’s ways are not our ways, God’s grace is entirely unpredictable, and God’s purposes can be accomplished through those considered unimportant. God doesn’t need celebrities. The genealogy includes four women – all outsiders who showed great initiative: Tamar (Gen 38:6-30), Rahab (Josh 2:1), Ruth (Ruth 1-4) and Bathsheba (2: Sam 11:3). Despite irregular marriages they became vehicles of God’s messianic plan. Thus, they have something in common with Mary (1:18-25) whose marriage to Joseph has an extraordinary element. Their inclusion proclaims God is on the side of the outcast and points forward to the pivotal role women play in the community of Jesus’ disciples. They are certainly not marginal to the history of Israel or Christianity. The genealogy tells us the story of Jesus Christ has a beginning. But it also has a follow-up – ‘good news’ for Matthew’s community and ‘good news’ for us. Just as the story’s beginning involved as many saints as sinners so too does the sequence: Peter denied knowing Jesus; Paul persecuted believers; yet Stephen died because of his belief. Down through history it’s been the same and today is no different. The God who used men of integrity as well as men who were murderers and women who were scorned, continues to work through us who are no different. And, just as the ‘unknowns’ were an essential part the story, so too today. Nobody is too insignificant or too unimportant to not have a role in continuing the story of Jesus Christ. So basically, the genealogy is an open invitation to us all to play our part. The genealogy also shows us God’s willingness to allow a monarchical institution to have an essential role in the story of Jesus’ origins, even though its leaders were – more often than not – corrupt, deceitful, and ineffective. Moreover, God has been willing to entrust the sequence to a hierarchically structured church, which also has its share of corruption, scandal and ineffective leaders. Catholics who want a perfect church without skeletons in the cupboard have failed to understand the beginning of the story. We have to be willing to confront the challenges that such skeletons put before us. The sequence to the genealogy reveals that Jesus called Peter and Paul, and Paul called Timothy and someone called you and you have to call someone else. But call them to do what? What are we supposed to do? Matthew tells us at the end of the gospel (28:1-20) in the Great Commission: ‘Go therefore and make disciples of all nations …’. Everything so far has been leading up to this point. There’s no need to worry despite the daunting task because Jesus says, ‘I am with you always’. (Matthew has already told us this – Mary’s baby will be called Emmanuel which means ‘God is with us’ [1:23] – and has reminded us again [18:20]). The women are absent but remember they have already met the risen Jesus and been directly commissioned by him (28:9-10) to tell ‘my brothers’ that he is alive, and they will see him in Galilee. Matthew presumes they have done this and the disciples believe. The disciples themselves had been alerted that Jesus would see them in Galilee after he had been raised up (26:32). So, 11 of them – Judas is missing – are now back in Galilee where it all started. They are on a mountain where, usually for Matthew, something new or transforming happens. Here the disciples learn about their new task from the Risen Jesus. Previously they have been commissioned to preach, heal, raise the dead and drive out demons (10:7-8). Now they are being sent to do four things: go out; make disciples; teach; and baptise. The key task is to ‘make disciples’. Only Matthew includes this mandate. The other tasks are a means to that end. Making disciples has been Jesus’ own task throughout the gospel. Jesus commands them to go and make disciples of all nations, a new missionary perspective contrasting the earlier one limited to the house of Israel (10:6, 15:24). Like the women (28:9) the disciples worship Jesus but some doubt, revealing they are just like us. Jesus claims ‘all authority on heaven and earth’ – given to him by God. Jesus’ commandments replace the Torah as teacher, the one who is to be obeyed. The content of the disciples’ teaching is all that Jesus has taught his own disciples spelt out in the five great teaching blocks. Here the greatest commandment is love of God and love of neighbour (22:34-40). The criterion of Jesus’ authoritative interpretation of the Torah is what God wants, that is, ‘mercy, not sacrifice’ (9:13). Indeed, it is against the works of mercy that we, this motley bunch of sinners and saints, will ultimately be judged (25:31-46). Haere, tukuna! Go, you are sent in 2018… to the peripheries of society; to develop a spirituality of service; to find leaders; to build community. For a lively version of the genealogy watch online at: (youtube.com/watch?v=OvZW58LQg_k). Byrne, B. (2004). Lifting the burden: Reading Matthew’s Gospel in the church today. Strathfield, NSW: St Pauls Publications. Brown, Raymond. (1988). A Coming Christ in Advent. The Liturgical Press: Collegeville, MN. Dr Elizabeth Julian rsm is a lecturer and distance co-ordinator at the Catholic Institute of Aotearoa New Zealand. Dr Elizabeth is retiring in December 2017 ‘to rewire into something else!’.